Tate Modern’s decision to stage a solo show of the work of Saloua Raouda Choucair is surprising, given its usual choices of high-profile artists whose names are rather more established in the UK. But lack of exposure does not always equate to lack of status. 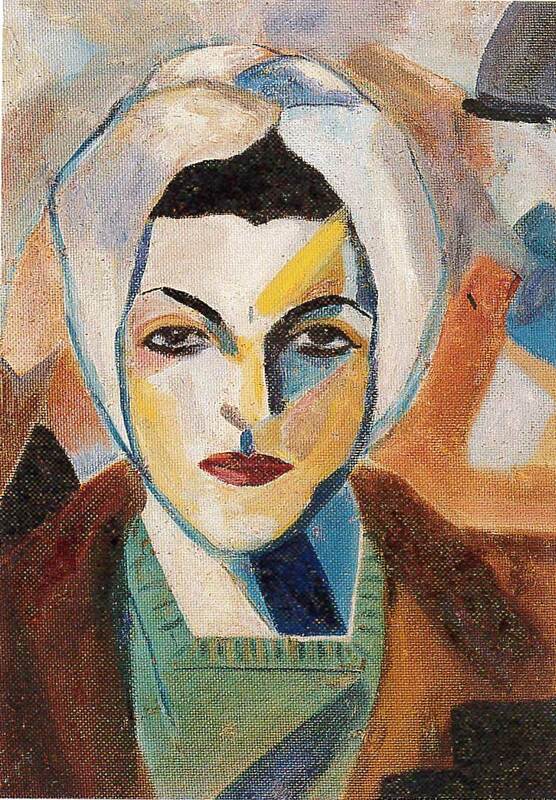 This Lebanese artist, born in 1916 – and now in her 97th year – spent over half a century producing art, and was a pioneer of abstraction in the Middle East. Her work combines traits of European modernism with traditional Islamic design, thereby reflecting not only her formal training in Paris but also her own heritage. Paris-Beirut (1948) is a cleverly designed canvas marrying elements of both cities: the Islamic star, the Arc de Triomphe, desert colours, and the base of the Eiffel Tower, symbolising the division of her life and artistic style between East and West. The exhibition offers visitors a gentle introduction to Choucair’s work. Opening with a piercing, almost haunting self-portrait, the rest of her canvases depict Léger- or Picasso-esque nudes and abstract forms. The influence of the former artist is especially noticeable, and unsurprising; she attended his studio for a time in Paris. Her trio of paintings entitled Les Peintres Célèbres (1948–49) has been described as a ‘softened’ version of Léger’s Le Grand Déjeuner (1921–22). But while it does seem that the nudes in Choucair’s works possess a greater command of their surroundings and are less rigidly constrained than Léger’s, to my mind they are hardly less passive, and only the standing figure with cocked head seems to offer any challenge to our gaze. If the exhibition is not pointedly feminist, it certainly tells a story of survival and commitment. It is remarkable that, having lived through the 1948 Arab–Israeli war as well as terrible civil conflict in her hometown of Beirut in the 1980s, Choucair should have continued to produce art with such a generally cheerful dynamic. Bright colours and confident forms speak little of the unstable environment from which they came. The irony is most evident in Two=One (1947–51), a canvas of pink and red whose jolly surface was badly punctured by glass during a bombing raid. No attempt has been made to repair the canvas; it is a chilling reminder of Choucair’s working circumstances, and proof of her perseverance. Choucair’s sculpted works are particular show-stealers. One might almost describe her as an ‘artist-architect’; she claimed that she would have chosen to pursue architecture in another life, and her passion for all things constructed and engineered is evident. A cabinet of maquettes for benches, water fountains and functional public buildings reveals Choucair’s talent for three-dimensional design and her ‘belief in the importance of art in designs for daily living’. Much of her career overlapped with Le Corbusier’s, whose architectural structures such as la Cité radieuse in Marseille (1947–52) might well have provided inspiration, given that Choucair photographed it herself. Especially striking are Poems, a series of structures composed of several parts or ‘verses’ that can be put together and ‘read’ in different ways, in the same way as Arabic poetry. These are beautiful to look at, but they defy permanence. Seen as miniature buildings, they challenge the concept of a ‘fixed’ structure and question the essence of architecture. The emphasis is on movement and potential – an idea that extends into the fourth room of the exhibition, which houses several of Choucair’s acrylic and nylon sculptures – and it is not difficult to make the connection between these and a state of war. Moveable and with infinite formations, the ‘poems’ are symbolic both of the world around Choucair and her artistic production. ‘Saloua Raouda Choucair’ is on at Tate Modern, Level 4, until 20 October. When will Italian museums do something to improve their websites? Fascinating introduction to this artist. Balanced and informative. An exhibition to explore.